The current spate of burglary and other crimes in different parts of the world gives serious cause for concern. While you may not be able to do anything about it, you can upgrade the lock in your home. To choose the most suitable locks for your home, there are several factors to consider. This article discusses the pros and cons of different types of locks. Lock manufacturing companies keep improving with the security of their locks. So, if your lock is more than 10 years old, chances are good that it is not as secure as the modern locks so you may need to change or upgrade your lock now. Here are the major types of locks. These locks are very strong and robust. With this type of locks, burglary will be very difficult because a steel bolt will be set in the jamb. This lock comes in two variants. You can get the one of double cylinder and the one of single cylinder. 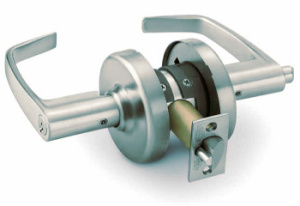 Double cylinder lock offers a high level of security. You need key to lock and unlock it. With this lock, a burglar cannot just break the window beside the door and dip his inside to unlock the door through the window. However, this can be dangerous in fire situation. Fumbling with the keys while serious fire is at your heel can be dangerous. This is why some communities have banned double cylinder locks. Single Cylinder locks are more common. You can lock or unlock it from outside with a key but you don’t need a key from inside. It has a knob that can lock and unlock it. Single cylinder locks are great but if your door is beside a window, this may not be suitable as burglars can break the window and dip their hands in it to turn the knob. These locks are levers or doorknobs and they have a lock in them. They are usually installed at the main door. They are used in tandem with a deadbolt. This type of locks has locksets with doorknobs inside and swan-neck handles on the outside. They also include deadbolt for maximum security. In some variant of this lock, the handle lock and deadbolt are interconnected. This lock offers convenience because both handle lock and deadbolt can be locked or unlocked simultaneously. These locksets are not so strong. In fact, they are not for security. They are only meant to prevent accidental entry so they are not suitable for the main door at entrance. You can only use them for interior doors. Choosing your locks also involves choosing the right grade. Grade 2 locks are meant for residential buildings while Grade 1 locks are for commercial buildings. Although Grade 3 locks exist and they are cheaper, their quality is relatively lower than the quality of the other two. So, stay away from Grade 3 locks. What are the best locks for your home? http://dallasfwlocksmith.com/best-locks-home/ 4.0/5 based upon 18 reviews.